A method of noise-robust numerical differentiation was proposed by Pavel Holoborodko in this article. 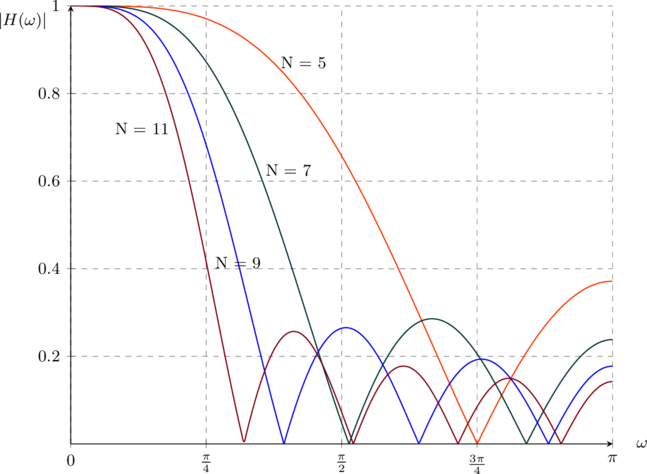 The novel idea is to design differentiator filter in frequency domain; it appears that it’s possible to build a family of numerical differentiators that possess compelling noise suppression and allow very efficient computation scheme. It seemed natural to re-use the Pavel’s idea to design smoothing filter which would be more noise-robust. Below I will walk through task statement and derivation down to the filter coefficient formulae. where is the filter length. 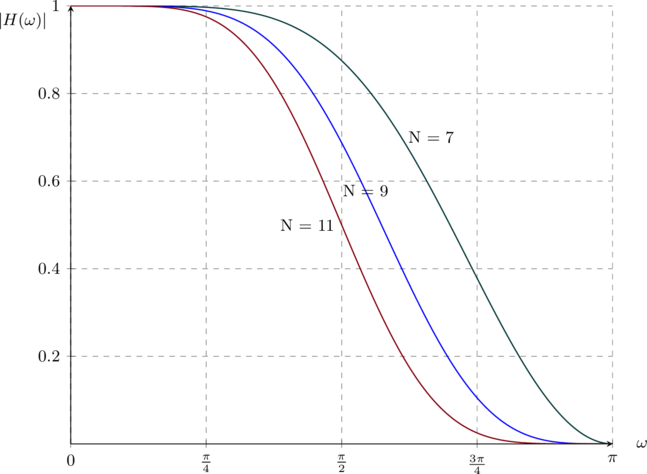 High tangency order with axis at high frequencies (noise suppression). Doing so makes the smoother exact on . Different scheme would yield different balance between degree of polynomial exactness and noise suppression strength. However, in this article I focus on the derivation for one specific case. This system of equations can be solved by general methods, but only for small . In particular, R’s solve function fails for which makes it hardly sufficient for practical applications. So, a specific analytical solution is needed. Now it’s evident that the rows form Vandermonde matrix with . Let’s denote such matrix as and, analogously, Vandermonde matrix with as . where only depends on , not or . Luckily enough, this formula holds also for and even negative . The direct expression above is more practical as it enables to calculate for . 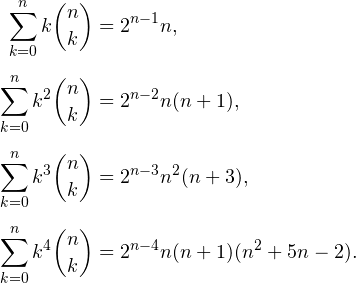 The normalization factor can be estimated using the first equation of (1). Like for Pavel’s differentiator, this formula enables very computationally efficient convolution implementation using only integer addition, multiplication and binary shift. At the same time, expression (5) may be more convenient, e.g. for analysis of asymptotic behavior. For larger , computationally efficient solution is to be discovered. It would be very useful to generalize the method to 2D and higher dimensions; this problem is also waiting for its researcher. Both generalizations will likely require development of more elegant method for closed-form coefficient derivation. Senior Software Developer @ ACD/Labs Inc. Thanks for the very nice extension of Pavel’s method. I am enjoying testing it out for a project. Perhaps there is an error in the last term of the above equation. 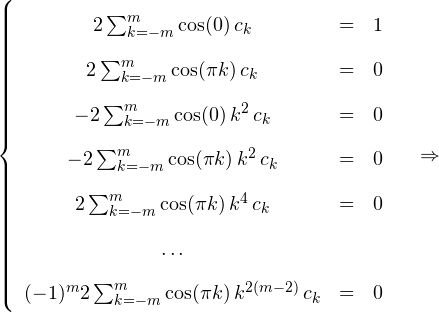 It seems that if m = k that the upper number of the binomial coefficient will be less than the lower number. If I understand this correctly this situation is not allowed. Please take a look at this. It could easily be that I just don’t understand something. It is the coefficient of the term in the polynomial expansion of the binomial power . For not in the binomial coefficient is zero. Thanks for the quick clarification. Indeed you pointed to something that I did not understand. Now my program gives the same results for this equation and equation (5). Thanks a lot for all this great information about the noise-robust smoothing filter! Do you have the extension of the method to two dimensions? I need to numerically determine the cross second order derivative for a noise two dimensional surface. The generalization for 2D and higher dimensions is yet to be built; no formulae are available at this time. For the second order derivative I recommend that you use original Pavel’s low-noise differentiators. You might also get some inspiration for 2D extensions from this article. Thanks a lot to share your knowledge! I need to filter a signal in real time and so I need a one sided/backward filter. Can the formulas and (5) rearranged to achieve my scope? If so, how? Thanks in advance for your availability! I think you can actually use the formulae by summing for , with proper normalization. Quick consideration suggests that you will need division in this case which breaks the elegance and probably speed; however if you manage to build Type II filter then you’ll only need to multiply centered coefficients by 2, due to symmetry. For small it’s easy to find with the help of modern computer math systems. Following my derivation it’s likely that closed-form expressions for any can be built; if you go for it and succeed, please don’t hesitate to share! Please note, that application of centered/symmetric filters for real-time signals introduce inevitable delay (= half of the filter in symmetric case). Probably exponential smoothing or similar will be helpful in your case (keywords: moving average with zero-lag). The entire financial industry is looking for the “Holy Grail” smoothing filter with minimal time lag/delay. The thing is that time lag minimization affects other properties of a filter , e.g. adds severe overshoot – so that all properties should be balanced which is quite tricky. Thank you for an inspiring text. It gives a nice and easily understandable method for designing maximally flat FIR filters. I was especially interested in the cases where the passband and stopband are symmetric. This leads to so called half-band FIR filter structure which is computationally very attractive since all the even index filter coefficients are zero except the center coefficient which has value of 1/2. 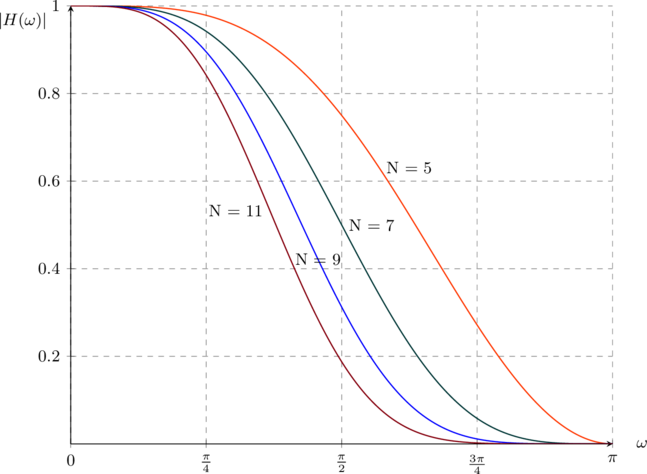 Because half of the filter coefficient values are known in advance, the design effort is reduced accordingly. C. Gumacos, Weighting coefficients for certain maximally flat nonrecursive digital filters. IEEE Trans. Circuits Syst. CAS-25(4), 234-235, (1978). This paper gives explicit formulas for filter coefficients in all cases. Khan, I. R. & Ohba, R., Explicit formulas for coefficients of maximally flat FIR low/highpass digital filters, Electronics Letters 36.23 (Nov 9, 2000): 1-2. Do the numbers in Khan, Ohba coincide with what I derived? The authors use quite different idea to derive the coefficients, and do not focus on fast filters nor on relation to time domain (exactness on polys). But of course, their formula is more general (based on required cut-off frequency) and they go further to presenting the high-pass filters (only sign of the coefficients should be changed). Quick question for equation (2), was the lower bound on the second sum suppose to be ? Since your skipping the k-th column to solve for ? Nice catch, the typo is now fixed. Yea just realized this doesn’t matter much since when . I’ve been steadily working through this **amazing** proof on my own, trying to understand & reproduce your results/derivation down to the ‘t’ with my own logic in MS Word. Very pain staking work with a limited math background, proofs of each of the steps seems necessary, but this stuff for some reason is very intriguing to me. To find your post was honestly like finding the “holy grail” for me a couple of weeks ago (which tells you how slow I am). But Thanks again for posting this & I hope you don’t mind my questions/corrections being a noob! It’s been a long time since your comment, but now re-examining my proof with a fresh eye I saw that there was inaccuracy indeed. After correcting Vandermonde determinant product limits to include , terms , are now successfully reduced (please note that multiplier 4 stays, at least until next step 😉 ). Thank you for your contribution, it did really help me now! thanks for sharing your nice work!!! I would like to smooth out noise from sensor data sampled at irregular time. Without this extension (unevenly sampling), on synthetic data, your filter seems to do the dirty job. Is there any kind of weighting schema to deal with that ? I to am interested in a formulation for non-equally spaced data.